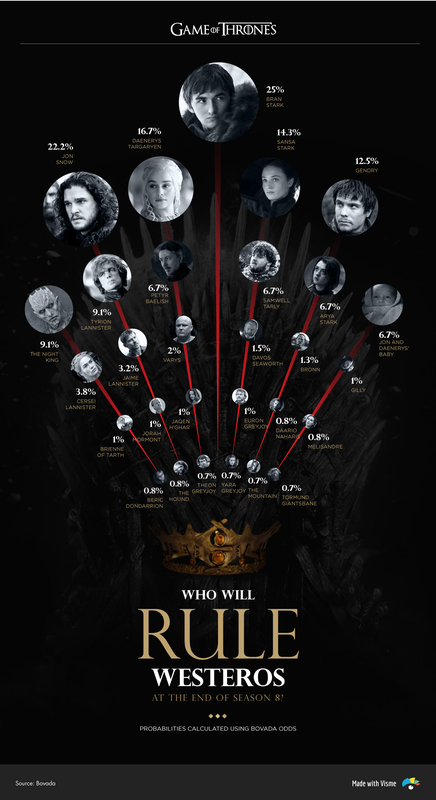 Our team at Visme, a data visualization tool, had a little fun visualizing the probability of each main character ending up on the Iron Throne, calculated using the latest odds published on the betting site Bovada. The odds reveal that Bran Stark is the most likely to end up on the throne, closely followed by Jon Snow, Daenerys and Sansa. Even Jon and Daenerys' hypothetical baby appeared in the results, coming in ninth place with the same probability as Arya Stark, Samwell Tarly and Petyr "Littlefinger" Baelish (some believe he faked his death last season using a Faceless Man). Another burning question on everyone's mind is: Who will die first in season 8? 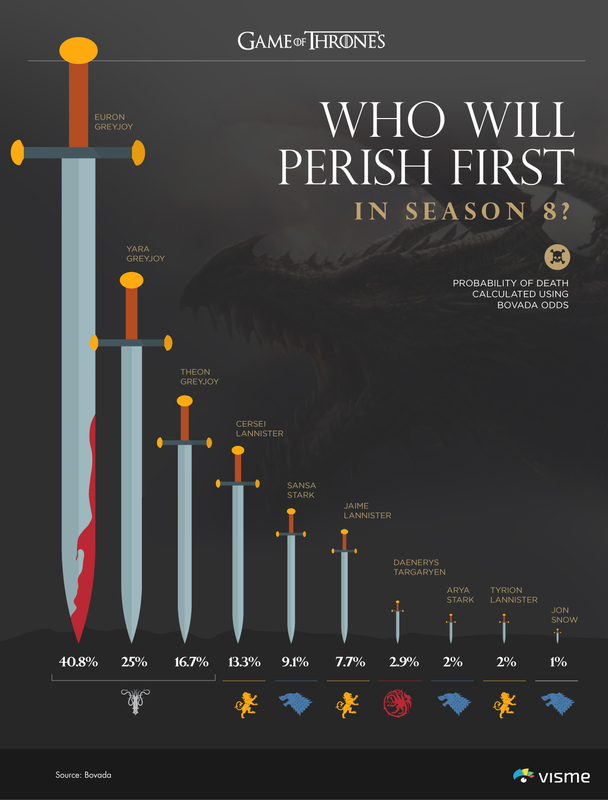 Using the same calculation to convert betting odds into implied probabilities, we found that the bookmakers consider Euron Greyjoy to be the most likely to perish first, followed by Yara, Theon Greyjoy and Cersei Lannister. 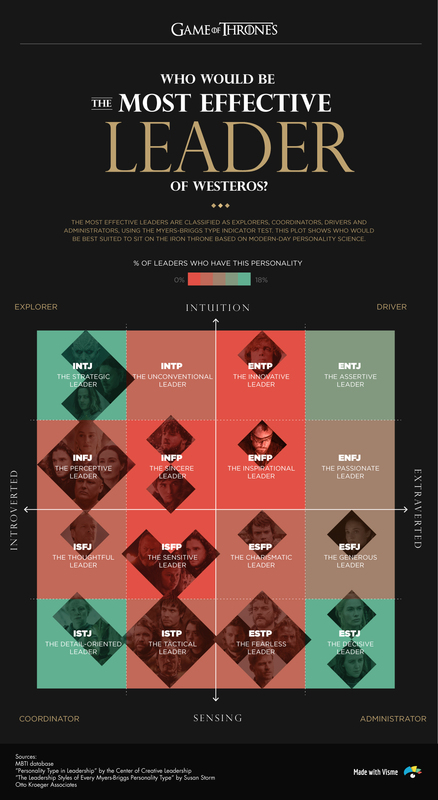 Being the GoT nerds that we are, we also got to thinking: Who would be the best suited to lead Westeros according to modern-day personality science? Using a horizontal scale with introverts and extroverts on either extreme and a vertical one to differentiate "sensing" from "intuitive" types, we plotted each of the 16 different personality types. We also visualized the percentage of leaders who possess each personality type, based on the results of a study of 26,477 leaders conducted by the Center for Creative Leadership. By deciphering the color-coded matrix chart, you can clearly see that the highest percentage of leaders are either INTJ, ENTJ, ISTJ or ESTJ (the four corners of the diagram). This means that although there are relatively equal percentages of introverted and extroverted leaders, as well as intuitive and sensing leaders, a majority of leaders studied preferred logic over emotions as a way of making decisions, and a planned lifestyle vs. a spontaneous one. What does this mean for the future of Westeros? Apparently, the best leaders are not always the good guys. In this case, the ones with the highest leadership potential are also some of the least favored to ascend to the Iron Throne. In the four corners you'll find: the Night King, Petyr "Littlefinger" Baelish, The Mountain, Cersei Lannister, Jaqen H'ghar, Brienne of Tarth and Yara Greyjoy. We used the latest odds published by the top betting site Bovada, which uses the American method of stating odds, and converted them into implied probabilities to evaluate how likely an outcome is, using an odds converter. Next, we plotted each of the 16 Myers-Briggs personality types on a 4x4 matrix chart and named each according to certified MBTI® practitioner Susan Storm's classification. Finally, we created a color-coded scale using Visme by assigning percentage values to a range of colors. These values correspond to the percentage of leaders with each personality type, as determined by the study "Personality Type in Leadership" by the Center for Creative Leadership. Who do you think will end up on the Iron Throne? Do you agree with our assessment? Give us your best evidence-backed predictions below.